Hereditary neuropathies are a group of inherited disorders affecting the peripheral nervous system. They are characterized by progressive loss of muscle control and/or sensory function. There are no effective treatments. I have had Hereditary Sensory Neuropathy Type 1 since I was 27. I am currently 51. It is a very slow progressing disease, but often disables the affected individuals severely after a long duration. My symptoms started in both feet and my symptoms include numbness, tingling and pain. Within the past 10 years my hands and fingers have also been affected. I have had partial loss of fingers due to minor injuries where I cannot feel pain and cellulitis that has caused severe damage to my fingers. The slow-healing wounds on my fingers have developed into chronic ulcerations. 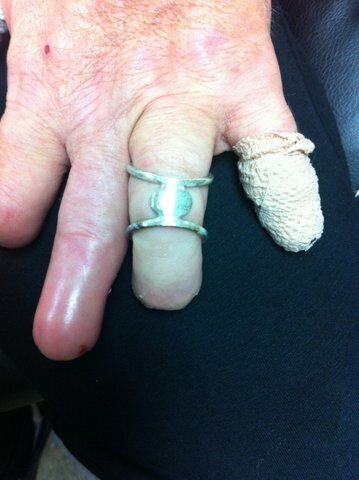 My latest frustration was my ring finger on my left hand was curling under due to loss of joint integrity. I am unable to straighten it. I researched splints for fingers on the web and found DigiSplint. Derek made me an incredible “Anti-Boutonniere Orthopedic Splint”. It not only gives me more function in this finger, I can now hold on to my cane easier and it looks awesome. Although this disease will continue to progress I am so thankful that I have been able to extend the use of my fingers with my splint from Digisplint.